Billed as a ‘Color Management Monitor for Photographers’ monitor, the 2560×1440‎ (1440p) SW700PT features a 27″ IPS panel with a dynamic contrast of 20M:1‎ and 99% Adobe RGB Colour Gamut for colour accuracy. 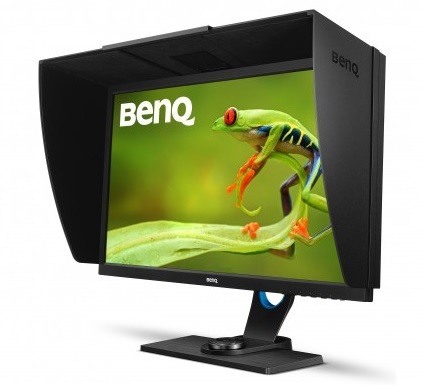 BenQ’s monitors tend to focus on specific areas, so this will appeal to those in the digital art world more than for gaming, entertainment or general home use. The build isn’t fancy but it’s deliberately kept glare free around the edges to focus attention on the screen alone. The bezels are fairly average size, it would be nice if they could design monitors more like modern TVs with thinner bezels, but these are certainly better than on other monitors I’ve tested. The monitor does come with side and top panels, though, which can be attached to avoid glare from outside sources and keep colours as accurate as possible. It’s amazing how much difference this actually makes to the screen and they’re pretty easy to fit, though they do take up a little more space in front of the monitor if you have a small desk. Buttons for controlling the menu options appear on the lower right side of the monitor, below small dots showing their position. It’s not my favourite place to put buttons, particularly if you have a desk with a recess for the monitor, but it does make the outline of the screen look more professional. The buttons are easy to press and are context sensitive based on the on-screen menus, so there are no pre-set functions assigned to any one button. It’s a fairly intuitive system which is easy to get used to, despite the location of the physical buttons. Ports are the standard 3 you’d expect to find; DVI-DL, HDMI 1.4 and DisplayPort 1.2 for video input, plus a headphone port. There is also a USB 3.0 hub built in with 2 downstream ports on the side, plus one upstream x1. They’re lined up under the monitor in a recess but are easy to get to, even from the front. As a professional monitor, you’d expect the SW700PT to do well in the screen department, and you’ve be right. The colour accuracy is excellent with colours popping out of the screen but still feeling authentic. The Adobe RGB 99% rating ensures that accuracy is key to this monitors function. Response Time is less impressive, though still perfectly usable for general gaming if you really need this to be a jack of all trades. With a 5ms GtG, it’s fine for regular gaming but maybe not for the professionals. For art it’s really much less of an issue. I’ve used this with an Xbox One X for testing the gaming side, alongside having it hooked up to a PC, and it can happily handle 4K console gaming (downscaled to 1440p) well. Even without HDR support, the colours look better than an average TV. While the SW700PT isn’t a gaming monitor, the usual BenQ quality build does make it a good stand in, just with a slightly higher response time than we’d like. The colour range and contrast, though, mean that this is a great choice for photographers and digital artists.